Visitors to ELEX at Alexandra Palace on 30th and 31st January (which is co-located with PlumbExpo, Toolfair and Pro Builder Live) will have the exclusive opportunity to meet NAPIT Group Chief Executive and Chief Technical Officer, as part of an expanded presence at the trade show. Mike Andrews and Frank Bertie will be on stand PB20 on both days of the show, available to answer any industry or membership related questions that attendees may have. 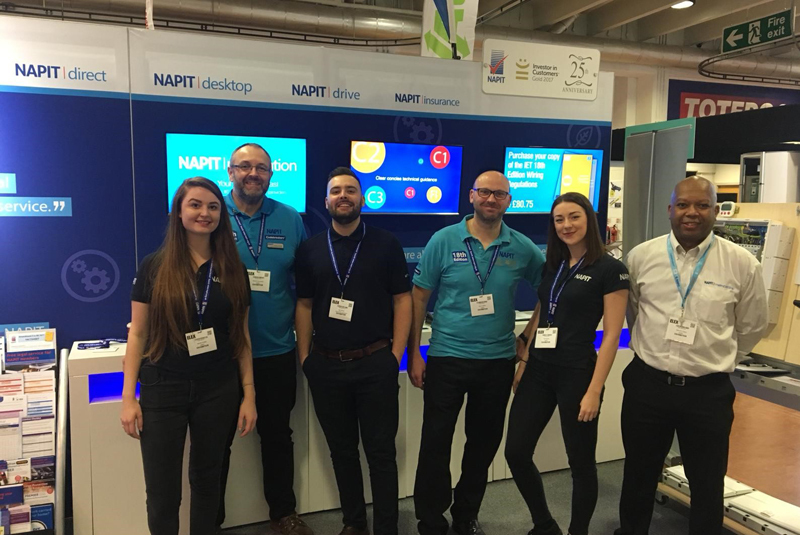 The rest of the NAPIT team will also be on hand on the stand, its biggest yet, for any technical and membership queries. Show offers will also be available on 18th Edition books and the brand new EICR Codebreaker guide, now updated to align with BS 7671:2018. NAPIT will be hosting three seminars on both days of the show. Technical Events Manager, Paul Chaffers, and Technical Development Engineer, Richard Townsend, will be covering 18th Edition Surge Protection Requirements [10.30-11.00], a new and updated EICR Codebreakers session [12.15-12.45] and Electrical Safety in Social Housing in partnership with Electrical Safety Roundtable [14.00-14.30]. Once again visitors will get the chance to win with NAPIT’s new on-stand competition. Crack the Codes is a digital EICR Codes test where participants will have to correctly code the real-world EICR observations within a specified time to be in with a chance to win a prize bundle!